On May 12th 2017, the WannaCrypt ransomware cryptoworm began spreading its way across the globe, infecting unprotected machines and encrypting files. Windows 10 users were not impacted, nor were those running the latest versions of Windows 7 or above that had MS17-010 patch applied from the March 2017 security update. However, those organizations running on OS versions that were out of mainstream support, or that had not applied the March update were vulnerable. In fact, those out of support OS instances simply had no defence (until Microsoft took the unusual step of releasing a patch for non-supported versions that were still under custom support agreements (CSAs)). But while the focus has been on the legacy, many missed the recent news that Windows 10 version 1507 (the initial release) is now out of mainstream support (May 9th 2017). In the same way that XP machines were vulnerable, so now are any Win 10 1507 machines, since they received their last ever security update and will be vulnerable to any newly discovered security flaws. Whether your organization was impacted by WannaCrypt or not, infections on this scale tend to focus the IT manager mind on the state of their environment. In particular, how quickly the possibility of another attack can be mitigated, and secondly, how to ensure that devices remain in security support. With most large enterprises currently on Windows 7, budgets for Windows 10 migration have been under review and acceleration plans discussed. 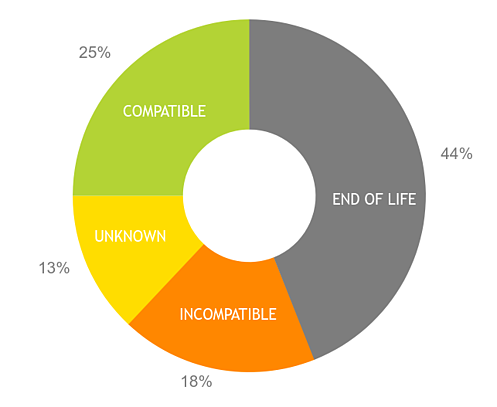 Since the initial Windows 10 1507 release reached end-of-life on May 9th, we think it is a great time to stop and check in: Where are enterprises with their migration plans? What drives this migration, what are they struggling with and how are they going about it? In the past, enterprises dragged their feet before rolling out a new operating system. And rightly so! Release 1 was rarely stable enough and common practice was to wait for the first service pack, or even skip OS versions completely. The cost of change was huge, and only the compelling event of an impending end of life date truly drove deployment volumes. Even today, more than 2 out of 3 business laptops and other devices still run on Windows 7, the seven-year-old Microsoft operating system that will go end-of-life early 2020. 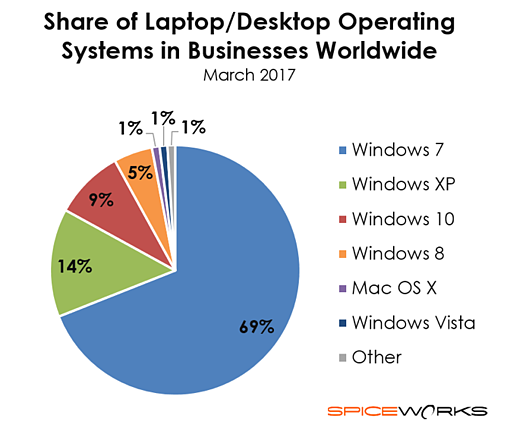 Moreover, 14% of business devices are still on Windows XP as of March 2017 — costing organizations millions of dollars for Windows XP extended support as Windows 7 became the standard OS. Running on operating systems that have already lost (or soon will lose) support isn't safe for any business. It’s high time to start taking Windows 10 migration seriously (if you haven’t already). And most organizations do already! According to a recent Gartner study, 85% of enterprises will have started their Windows 10 deployments by the end of 2017. On the flip side, according to 1E, only 6% of enterprises have already completed their migration. Businesses know they can no longer afford to avoid the issue. Just think of WannaCry 2. The recent malware attack held countless PCs at Britain’s National Health Service, some of Spain’s largest companies including Telefónica, as well as computers across Russia, the Ukraine, and Taiwan at ransom! And it all could have been avoided had these PCs been up-to-date. Cyber security risks have vastly increased in the past few years, so it’s no surprise that 49% of Windows 10 adopters are motivated primarily by the security benefits. On the bright side, organizations who do keep pace with Microsoft's accelerated upgrade schedule for Windows 10 will see significant improvements. Forrester claims that up to 33% of security events requiring IT remediation will be reduced or avoided with Windows 10, resulting in $1.3 million in cost savings over three years. Beyond the need to bolster enterprise security, application compatibility is a major concern when migrating to Windows 10. To avoid any costly disruption to employee application access, as it diminishes employee productivity, organizations have to be careful to identify any application compatibility issues before a full-blown migration. 13% are unknown because they are in-house or there is no vendor support statement. While this is one of the toughest Windows 10 migration challenges, our survey found that merely 16% of IT teams have already tested all of their applications. You could say we have been around the block a couple of times when it comes to enterprise IT OS migrations — having helped hundreds of organizations around the globe ready more than five million assets for successful upgrade. In our experience, an undertaking as complex as this can take anywhere from 44 to 124 man weeks, depending on your approach. Even with Microsoft touting a much easier and faster migration process, most organizations, according to 1E State of the Migration: Enterprise Windows 10 in 2017, do expect this to take more than a year, with 16% of them planning on more than 2 years and 15% budgeting for more than 18 months. 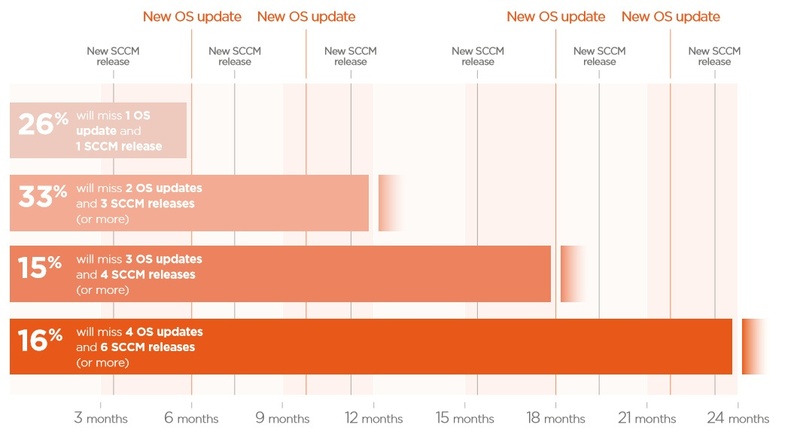 If it takes an enterprise more than two years to deploy Windows 10 across their entire organization, Microsoft will have already released 4 new OS upgrades and 6 new SCCM upgrades in that time. So, based on the estimated time to complete the migration, 64% of the enterprises will, at a minimum, be already 2 OS and 3 SCCM upgrades behind upon completion of their initial migration. By the time you finish the project (or even during the project), you could be facing another end-of-life deadline. A Windows 10 migration will be challenging, and there should certainly be a sense of urgency in the process, as well as a drive towards ongoing pro-active upgrade management for Windows 10 to Windows 10 versions. When you deploy Windows 10, will you undergo a complete hardware refresh, reimage existing devices, or will you move forward with an in-place upgrade? There’s no single correct answer, but the choice you make can have a significant impact on the overall cost and duration of the migration project. We have surveyed more than 100 IT professionals over the past 12 months, and 49% of them indicated that their hardware is somewhere between 2-4 years old, making them a prime candidate to align the Windows 10 migration with a hardware refresh. This correlates with findings in the recently released report on the Enterprise Adoption of Windows 10 by 1E. The study finds that 36% of respondents will combine in-place upgrades and hardware refreshes, while 33% are planning to only do an in-place upgrade and 31% will rely on hardware refreshes to migrate their end user base. One of Microsoft's biggest selling points for Windows 10 is that it will boost employee productivity. In fact, Forrester states in its Total Economic Impact Report: "Mobile employees estimate they can take advantage of 25% of time previously unavailable for work, enabling them to get more done more quickly wherever they may be." While you can expect productivity to increase, you have to be careful how you deploy and rollout the new OS, as changes to the employee desktop environment can be disruptive. For example, retaining personal settings throughout the Windows 10 migration can prove challenging for the IT organization without the right tooling. Our Windows 10 readiness survey found that 15% of organizations have already created a detailed deployment and logistics strategy for migration. But for the 43% of IT organizations starting to outline their Windows 10 migration strategy (and the 42% without an implementation plan yet), understanding how the logistics of deployment impact the end user experience will be a critical success factor. 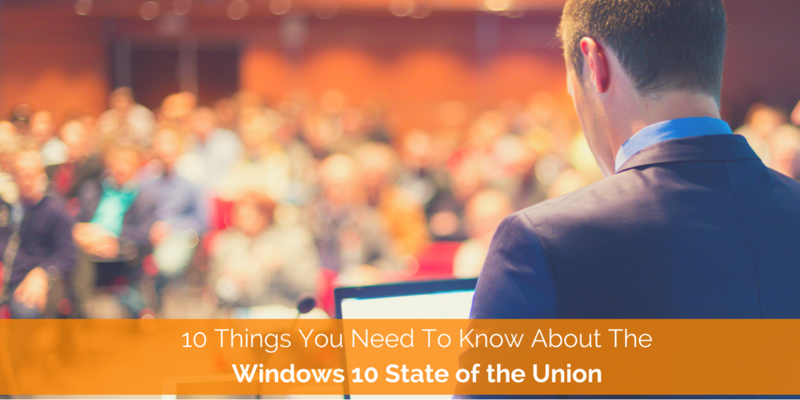 Understanding resource utilization, application usage, privilege needs and other end-user metrics will help keep employees happy and drive adoption when Windows 10 rolls out. This challenge isn’t new to Windows 10, but the new branching program might magnify it. Attackers look for any weak links in operating systems to exploit as an entry point to your network. Unpatched machines are just asking for a widespread data breach. Especially as Windows 10 introduces more frequent updates, solid patch and upgrade management will be critical to the security of your organization. One critical component of patch management is the desktop management system you have in place. We found that 68% of IT organizations are prepared for Windows 10 with Microsoft SCCM 2012, 2016, or an equivalent solution in place. However, the 32% of teams that either don’t have a desktop management solution in place or have an outdated tool will face patch management challenges as they try to keep up with Windows 10 updates. Make no mistake — a project of this magnitude will not come cheaply. 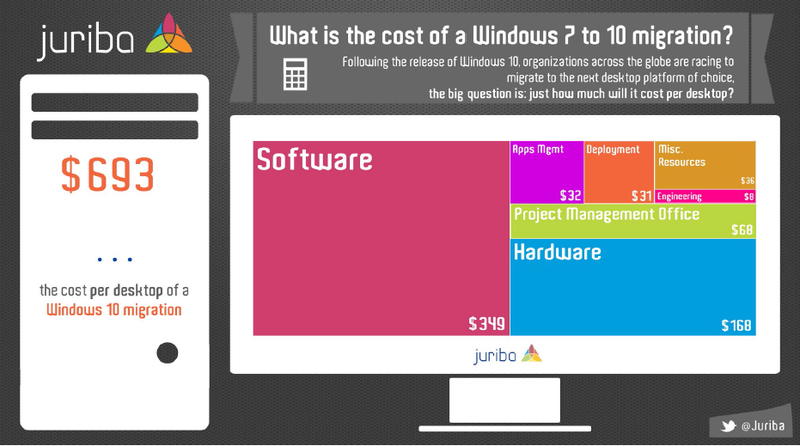 Unfortunately, financial officers often son’t see Windows 10 as a mission-critical project to budget for. Prepare to make a solid business case for Windows 10 and make a proper budget for resources, hardware, and software. Depending on your migration approach, you can estimate between $493 (automated approach) and $693 (traditional manual approach) per device. 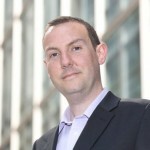 Will you be part of the 44% of teams using internal resources for migration? Or will you outsource like 42% of survey respondents? Your decisions will impact the overall budget and influence business approval. No matter where you are in your Windows 10 migration (planning) process, it is critical to understand that your organization must complete the process swiftly and in a strategic and efficient manner. There is no getting around it. Organizations will need to keep pace with Microsoft's accelerated delivery schedule and they need to do so in an automated manner or else they risk chasing one end-of-life deadline after another — all while exposing their entire organization to malware and other cyber security risks.